On November 15, 1945, as remaining units of the 12th Air Service Group prepared to leave China, the Shanghai Evening Post & Mercury carried an article briefly outlining the group's China history. We reprint it as it appeared, and with it present a number of pictures submitted by members of the group. Members of the 12th Air Service Gromp, the first to arrive in China, are packing up this week to sail home on the Adabelle Lykes. Just two years and two days from the time they left the states, GIs of the 12th were flown down from their base at Hankow and started through the processing center at the China Theater Replacement Service. The 374 enlisted men and 16 officers remaining of the old 12th will go up the gangplank Friday. Sailing date is Saturday. Those leaving on the Adabelle from the 12th are members of the Headquarters and Headquarters Squadron, 1066 Quartermaster Company, 1102 Signal Company, 2124 Quartermaster Truck Company, and the 1835th Ordnance Supply and Maintenance Company. The 397th Air Service Squadron, its high point men replaced by low point men, is being retained at the Shanghai Air Depot for a few weeks to complete an assignment. 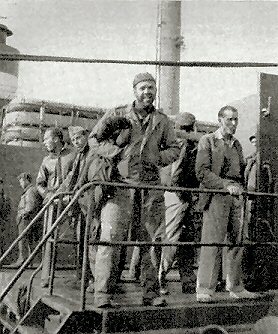 GOING HOME, men of the 12th line the rail of the S. S. Adabelle Lykes. ALL FOUR commanding officers of the 12th were on hand at the dock in Shanghai when the group returned to the United States in November 1945. 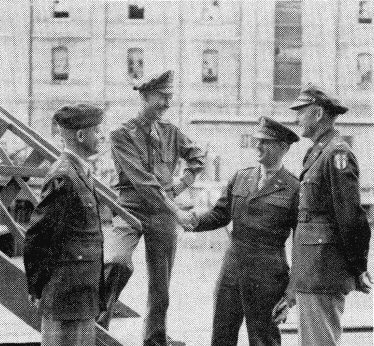 Col. Robert J. Koshland (second from right) who took the unit overseas, is shown extending best wishes to Lt. Col. (then Major) Neil L. Maurer, who brought it home. Looking on are Col. R. H. Wise (left) and Lt. Col. Maurice J. Hollman. 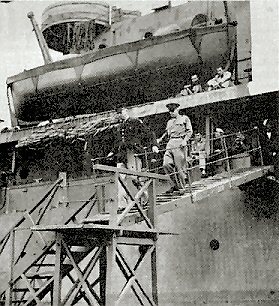 ON HAND to see the 12th off from Shanghai on the return voyage in November 1945 were Lt. Gen. Albert C. Wedemeyer, theater commander, and Col. Clarence Talbot, shown here as they left the ship. Maj. Neil L. Maurer, who recently replaced Lt. Col. Maurice J. Hollman as C.O., will return with the group. Colonel Hollman is remaining in China to serve with the Liaison Mission. On hand to assist in the processing of the organization was Col. Robert J. Koshland, Commanding Officer of the unit from the time it left the states until last February when Ccl. R. H. Wise assumed command. 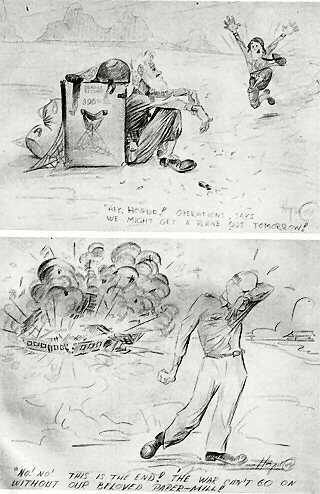 Colonel Koshland, Asistant Chief of Staff, Administration, at Headquarters China Air Service Command, added a sentimental interest to his official chores as his department worked over the records of the men going home. The 12th's first days in China date back to the time when seven C-46 transport planes was a lot of planes, supply lines were shoestrings, and the men were expected to do a lot with a little. Those were the days of improvisation. 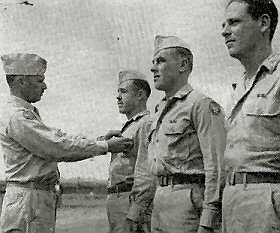 The men started corning over the Hump in January of 1944 and completed the move in February after which the second eldest service group, the 68th, flew in from Chabua, India. The 54th Air Service Squadron, which had been here since the days of the American Volunteer Group, was absorbed by the 68th. 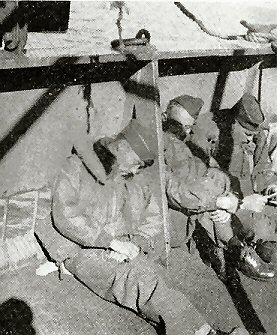 TIRED members of the 12th, enroute home, sleep on deck of the SS Adabelle Lykes. ROADSIDE SERVICE is conducted in China by Capt. 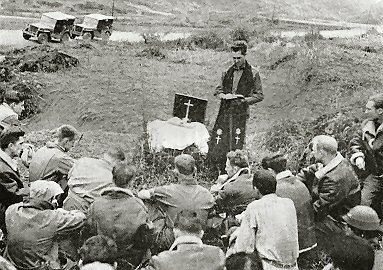 James Kelly, 12th Air Service Group chaplain. As its service center area, the 12th was given the responsibilty for the maintenance of all aircraft of the Air Forces and provision of all supplies, east of the 108th Meridian and south of the Yangtze, with headquarters at Yang Tong field, Kweilin. Sector commanding officer at the time was Colonel Wise; Colonel Kashland was Group Commanding Officer. Lt. Col. Albert J. Binsfield, now at Hq. AAFGT, was executive officer. The job of the 12th was to serve all units of the 68th Composite Wing and the forward echelon of the 14th Air Force in that area. The 12th went so far as to service the Chinese-American Composite Wing, as well as units of the 69th Composite Wing at Liuchow and Nanning. Units of the 12th were all over China, repairing and maintaining Army Air Forces planes. Its personnel were included in that group of American soldiers who did vital jobs without accompanying glamor and publicity. Theirs was a sordid, dirty, tnankless job. They went about their work at bases like Suichwan, Hengyang, Lingling, Chihkiang, Liuchow, Nanning, and were often subjected to aerial bombings. Such was the possibility of paratroop attacks that an extensive group defense system to cover that potential threat had to be set up. When the Japs began moving south threatening the Kweilin headquarters, the partial evacuation of Kweilin began on June 23, 1944. Some of the 12th A.S.G. men left by rail, motor and air for Luliang, Yangkai and Chengkung. The 12th continued to operate, however, with reduced personnel. During the time the entire group was in East China the Japs made many raids and caused much additional loss of sleep through air threats which alerted all persons. The Group will find it difficult to forget the 17 consecutive nights spent in caves in the hills surrounding Yang Tong Field. Finally being forced to evacuate on September 14, they reopened operations at Luliang and Yangkai. The sizable detachment still at Liuchow was evacuated November 8. 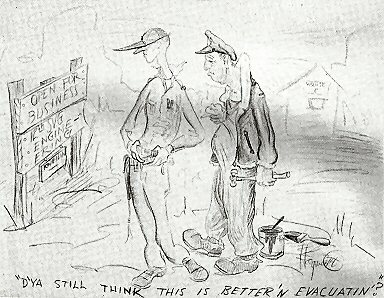 396th Service Squadron, 12th Air Service Group, about the time of the evacuation of Kweilin. The 12th continued to service the 14th Air Force, particularly the 68th Composite Wing, from its new location at Luliang. It reached out to lend support to squadrons of the 341st Medium Bombardment Group of the 69th Composite Wing stationed at Yangkai. Because its men got to see more of China than any other outfit, the 12th has often been referred to as the luckiest group in China. In February 1945, headquarters was moved from Luliang to Chanyi, and then on March 31 to Peishiyi to service the Chinese-American Composite Wing. Chihkiang was designated as its headquarters from July until October when it was moved to Hankow. Its work at Hankow consisted of servicing troop carrier outfits of the 10th Air Force in the movement of Chinese troops to Peking. Then, their work done, the men were flown to Shanghai on November 12 for processing and departure stateside. Three other units, the 396th Service Squadron, the 1836th Ordnance Supply and Maintenance Co., and the 2459th Quartermaster Truck Co., which had remained at Liangshan, have been flown back over the Hump for departure from India within the past week. It's been a long time but the 12th is on the way. AWARDS are presented by Col. Robert J. Koshland (left) to men of the 1836th Ordnance Supply and Maintenance Company. 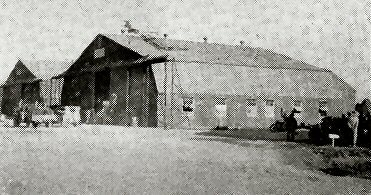 HANGARS on the air base at Hankow, used until war's end by the Japanese, were a temporary mess hall for men of the 12th. 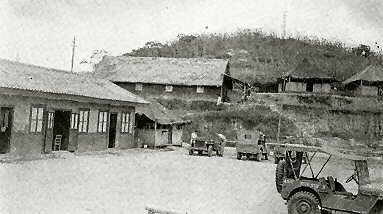 BASE HEADQUARTERS at Liangshan, operated by 12th Air Service Group personnel, with officers' quarters on hillside in background.